Abstract: In spite of the differences in cultural and ethnic background, this study showed that cancer patients living in Malaysia, Indonesia and Singapore, experienced post-traumatic growth just like their counterparts in Western countries. Participants of this study became more appreciative of their lives in addition to have grown spiritually. Their personal growth had made them become better individuals and they became more aware of the need to cultivate better relationship with others. One of us (CT) once told a cancer patient: “You are lucky for doing so well”. She retorted: “What is so lucky about me? I have cancer and that is bad enough”. We then told her that although she was bald, she was lucky for she did not suffer any other severe side effects from her treatment. We have seen patients with swollen arms while others experienced severe pains. Some other patients died. She should consider herself “lucky” to be alive without any suffering. Another patient told us that her cancer was a “blessing”. Because of her cancer, she got to learn how to live and eat rightly. As a result her entire family benefited from this new awareness. Her children became healthier and did not fall ill as often as before. These examples illustrate how patients perceive their cancer experience in different ways. Some viewed it negatively, while others positively. Indeed personal factors such as beliefs, values and commitments play an important role in determining how patients evaluate outcomes [ 1. Not all patients find benefit in their cancer experience. It is also possible that post-traumatic growth is beneficial in some contexts but not others. There is now a growing body of research suggesting that patients may experience positive life changes as a result of cancer [ 2, 3 ]. Roughly half of the people emerge from severe life crisis feeling enhanced rather than diminished [ 4 ]. Currently most of the studies on post-traumatic growth were done with cancer patients in the developed countries. Since values, beliefs and experiences differ among people of different nationalities, cultures and ethnic origins, our present study aimed at finding if cancer patients living in Malaysia, Indonesia and Singapore share similar perspectives as those in the Western countries. Researchers described the experience or expression of positive life changes as a result of facing a life crisis such as cancer, with terms such as: benefit finding, post-traumatic growth, resilience, thriving, positive illusion and cognitive adaptation. The term post-traumatic growth suggests something gained or a higher level of coping or psychosocial quality of life is achieved [ 5 ]. Various authors have provided the rationale of positive growth. When made to face their never anticipated vulnerability after being diagnosed with life-threatening illnesses, individuals are often made to rethink the meaning and purpose of their lives and reexamine their priorities [ 9 ]. Sometimes only drastic situations can force us to take on such painful processes of reevaluation and change [ 4, 6 ]. By that individuals can mature and develop in meaningful ways. The positive changes that occurred as an outcome of encountering life-threatening trauma are expressed in various ways, such as: enhanced acceptance of one’s vulnerability, increased appreciation of own existence and greater appreciation of life, increased perception of competence and self-reliance giving a greater sense of control and security, increased compassion and empathy for others, closer relationship with others, stronger religious or spiritual beliefs, greater meaning about life and suffering, greater psychological and emotional maturity and acquisition of new values and life priorities [ 5, 7 ]. Growth does not come easy. Sometimes, it hurts to grow. The journey begins with brokenness and deficits through a long journey of recovery [ 8 ]. In the process, shattered assumptions have to be restored; confidence to be regained and the physical, emotional and spiritual have to be nurtured. This growth is experiential not merely intellectual – and that is what makes it a powerful agent of change [ 9 ]. Questionnaires were given out to cancer patients who came to CA Care to seek further non-medical treatment after having undergone medical treatments for their cancers. They participated in this study on a voluntary basis after the aim of this study was explained to them. They agreed to participate in this study by signing a consent form. Most participants were from Malaysia while a few of them were from Indonesia and Singapore. A total of 128 patients answered the questionnaire. They consisted mostly of women (65.6%), and mean age of patients was 52 years old (SD = 11.16; range = 17-85). Most participants were married (79.7%) and a significant number of them were either housewives (28.9%) or retirees (19.5%). They were mostly from Chinese (79.7%) and Malay (13.3%) ethnic backgrounds. Patients generally affiliated themselves with a religion: Buddhism (44.5%), Christianity (28.9%) and Islam (16.4%). Participants were asked to answer the Post Traumatic Growth Index [ 10 ], a 21-item inventory that measures the positive changes that an individual experiences after a traumatic event. The instrument comprises of 5 factors that determine the major domains of post-traumatic growth: relating to others better (7 items), recognizing new possibilities (5 items), a greater sense of personal strength (4 items), spiritual change (2 items) and greater appreciation of life (3 items). Participants will answer ratings which ask the extent of change cancer has brought to their life (0= I did not experience this change as a result of my experience with cancer, 5= I experienced this change to a very great degree as a result of my experience with cancer). An open-ended question was added at the end of the questionnaire: “Please share with us your significant changes in your life as a result of your cancer experience”. To explore further the personal experience of cancer patients, we interviewed some participants. 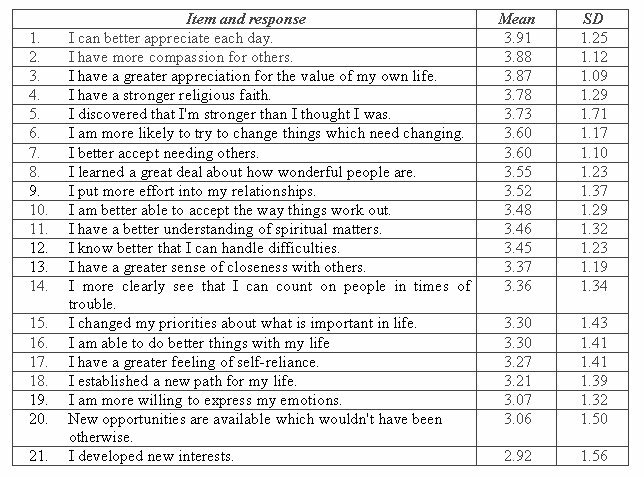 Three responses consisting of: “I have a greater appreciation for the value of my own life, I can better appreciate each day, and I changed my priorities about what is important in life” under the domain of one’s appreciation of life, had the highest score (Table 2). This was followed by spiritual change. Many patients reported having a “stronger religious faith and/or having a better understanding of spiritual matters”. The scores were even between personal strength and relationship with others. After the cancer experience patients became more mellow in their outlook. They developed more compassion for others, better accept needing others and cultivated better relationships with others. In terms of personal strength some patients discovered that they were stronger than they thought. The questions grouped under the domain of new possibilities had the lowest score. Table 2: The major domains of posttraumatic growth. Out of the 128 participants who answered the questionnaire, 19 of them answered the open-ended question. The responses below revealed their inner feelings about their cancer experience. Now I only do short term planning. Winding up risky business to regain peace of mind and reduce stress. This is for me to enjoy the remaining part of my life – to relax and stay happy. My cancer has helped me focus on living rather than dying. It has helped me also to be thankful for the daily blessings. I learn to take a day at a time. I appreciate life. Life has given me a new dimension and life gives hope in every sense. Many things have a greater clarity and I feel a sense of purpose for the years ahead as they impact on our children and grandchildren – they need us, so the target is to stay alive! We are in God’s hands. This experience has certainly given me some positive meaning to my life. I realize that I am vulnerable, and should value each day as it comes. Do not let little things worry us, and to be able to feel greater magnanimity. Happenings and personalities at the workplace are not that important in the bigger scheme of things. It is also important for me to feel happiness and look on the bright side of life. You treasure life more. You become more attentive to other people’s view, sensitivities and mood. One tends to show loving feelings towards one’s close relative, children and of course, wife. This cancer has given me a more positive meaning to living. Now, I only focus on my top ten priorities in life. I have clear goals and I work toward each of them everyday. I only do what is important in my life and I only live in the present moment – aware of my being. I am more joyful and make it a point to pamper myself every single day. I learn to love myself and I learn to be selfish! I don’t bother to please anyone anymore. I just live for myself. I have come to terms with death. I am prepared for it and I have no more fear. We are only trying but God determines. It has basically taught me to treat the disease as a ‘gift’ or a blessing from The Almighty. My cancer has made me appreciate the value of a simple smile from my youngest daughter, not to ignore her constant invitation to have fun and play games with her. It has taught me to appreciate how important ‘little’ things are to her – like talking to her Polly dolls, and make believe games. I cry more over the beauty of the sunset, the countless blue hue of the morning sky, the smell of freshly cut grass, and the sound of rain hitting the roof. I have wasted so much time over ‘big’ projects in the office and at work. I now realize there are so much in life that God wants me to have the opportunity to appreciate in order to glorify His creation – this is an opportunity I intend not to miss. My cancer has caused me to stop and think, to pray and know God better. During the period when I was recovering from the painful effects of radiation to my mouth and neck areas, I was unable to talk very much; even a sip of water was painful. The only person I could talk to then was God who provided all the consolation and blessings. I am a Christian, believing that everything that God has allowed to happen in my life has a purpose. Since I was diagnosed with cancer, I was at first very confused and sad as to why it should happen to me. But I can only do what I can control and surrender the rest to God. Since then I really experience the real meaning of knowing how much He loves me and make me worthy in His eyes. Ephesians 3:17-19. What things happened, it is our reaction that matters the most: either I can cry, question and blame God or any other reason for the situation. Or I still can cry but ask God to help me and direct me the best way to handle the situation. I chose to do the latter. It has been a real soul searching, tremendous learning journey. My cancer experience has given me a “positive” meaning to my life after I have survived from my cancer. And because of that I have gained my faith in Our Lord. I experience a closer walk with my God that gives me the peace and comfort. Cancer may have brought me to the lowest and scariest. I know I have climbed out of the pit and am way beyond that. Having beaten / managed cancer, I feel that I can handle much more difficult issues. In school, I was a hurdler and I was always fearful of each hurdle I have to jump over. Now, after having cancer, there is no more fear of any hurdle. I do my best and learn new tactics to clear any hurdle that comes my way. Now, I have a proper understanding of myself, environment and condition and I can see through things! I listen to myself and the people around me. I learn to see “white” and also see “black”. My cancer has also helped me discover a ‘new’ mindset – that is to make positive thinking a habit until it becomes second nature to me. I now realize that God has given me so many gifts that I have yet to unwrap, and with this new mindset, I am discovering things that I never knew existed before or I was capable of – like how to be happy when everyone else seem gloomy and miserable. I concentrate on getting more knowledge on alternative medicine, nutrition and health which I believe to be the missing link to my healing journey. I must keep myself healthy – trying to be always fit and in good condition, and be concerned with what I eat and drink. Understanding cancer, particularly your own, is important. Research is a key factor to obtain more knowledge and understanding of the disease and all the options open for complementary / natural / herbal remedies. I am also more compassionate and do not pass judgment on others anymore – am not critical anymore. I accept my own and others’ weaknesses. I am able to take people’s weakness with greater patience, knowing that there are more important issues that need handling. My relationships with family members and friends are seen in a different light, and I am more appreciative of them. I become more understanding and forgiving. My relationship has changed. After I had cancer, I feel very lonely. I work from 7 a.m. till 6 p.m. – eat, go to sleep and take my medication. I do the thinking and do what is required. My family does not discuss much about my cancer. I feel very lonely because my husband had neglected me after I had my mastectomy. He never asked about the treatment that I had or if I was feeling any better – he never did. The feeling of worthlessness made me feel so restless. Before my cancer he loved me very much. I don’t understand this sudden change in my husband. I hate my illness and the attitude of my husband makes me hate him too. I also learn how to control anger by forgiving others who hurt me. With the knowledge that I have gained I discovered that other people know so little about taking care of their health and when they are very sick or told that they have cancer they were lost. They thought that their doctors can tell them what to do and this is what that leads them to their downfall. With the knowledge that I gained I also give help and advice to other sick people. This is to encourage them – to give them hope and teach them to decide what to do. I felt very pleased when I have given them hope. I wish I could give help and hope to more people. I am happy to share my pains with others and be useful to others. I have become very negative emotionally and am not receptive to people who try to help me. I always think that I surely going to die of cancer and nothing can help me. I do not want to exercise or try anything that other people recommend, e.g. meditation. I always feel scared for the ‘end’ will come very soon. The permanent damage caused by radiation to my physical self, has caused me to be socially less active significantly affecting relationships with friends and relatives. The change in my diet to one of only vegetables, fruits and fish is a tall order and my discipline in doing so has made me more reclusive and domesticated. Although I believe that it has helped me in my overall health, I do not quite like the present lifestyle that I have been compelled to live by. I would have preferred my previous lifestyle where I am socially more active and very flexible. Cancer had negative impact on my business life. I am unable to entertain and felt like a peculiar animal behaving differently from everybody else as I was not able to go along with most of their activities. The side-effects from my dry mouth as a result of the radiation necessitated me to have drinking water wherever I go. During long meetings when I run out of water, it inhibits me from speaking as the dry mouth effect takes its toll. I cannot eat outside food and have to pay close attention to my diet. I have to eat the herbs and medicine everyday and it became a habit. I couldn’t fully enjoy traveling because of my diet. The following is a brief excerpt of Irene’s interview in July 2006 with a participant who had brain cancer. This 23-year-old lady was in a coma and spent almost three months in hospital. She recovered from the coma after taking herbs. Since her recovery she is doing well for the past five years. IT: In your cancer experience, do you find that cancer has brought you any benefit or “goodness”? Participant: I learned how to control myself. I was not emotional as before. IT: What did you mean by being emotional? P: Before I had cancer, I had a bad temper. I could punch people. There was an occasion when a bus driver touched me unnecessarily. I punched him. After I had cancer, I learned how to control my temper and became more tolerant towards others. P: I understand others better. Before I had cancer, I often give orders to people – I was always hard and demanding on people. But now, I have been given the gift of being more tactful when dealing with people – I am more tolerant now. In my life, I place this relationship: God, myself and others in that order. All of them played significant roles in helping me cope with my current situation. On 1 August 2006, Chris interviewed a 47-year-old breast cancer survivor. She had breast cancer twelve years ago and had undergone a lumpectomy. She declined further medical treatment and opted for alternative therapy. Chris: Having gone through this cancer experience, do you find any meaning in this cancer? Participant: Oh, yes. Cancer has made me see another view about life. In fact, I would say that I was “blessed” to have this cancer. C: Are you sure that it is a “blessing”? Or are you just saying this to make you feel “happy”? P: No, I know it to be true. If I did not have cancer, I would have continued to live life the way it was before I had cancer. And I do not think I would like myself. I don’t think I would have made “fast” friends that I had acquired after my cancer. This cancer experience has open up a new meaning about what life and friendship are all about. As such, I experienced a more meaningful and purposeful life. I don’t deny that at times, I do feel stressed or depressed but these “bad” moments are not long enough to adversely affect me. This is because I know that I have within me the strength to cope with such problems and I know for sure that I have friends who will support me physically and emotionally. I know that I cannot overcome my problems alone, no matter how strong I am. But with the support of my close buddies, whether by picking up the phone or seeing them personally, I know I can go through life without problem. C: If you have a chance to live life again and make a choice between your life before you had cancer and the life you are now leading, what would be your choice? P: I definitely choose this present life with cancer rather than my life before I had cancer. C: Why do you say this? Is it because you have been influenced by those people who wrote the many books that you read? P: No, no. Admittedly, I read books but I did not feel or experience what I read. I only read about it. But, right now I am telling you that I am experiencing what I have read. So that experience is my “truth”. C: You experienced a life before cancer, and you are now living a life after cancer. And you think that you feel the difference? P: Yes. Now, every day when I wake up in the morning, I feel blessed because I am still breathing. I am full of gratitude and appreciate everything that happens in life each day. This sense of gratitude is always there. In fact, I and my friends are going to start a project called the “gratitude tree”. We are going to make a tree but without leaves. Then each day we are going to hang a leaf onto this tree. On this leaf we are going to write each blessing that we experience for the day. For example, thank you for the wonderful meal, thank you for the pretty dress that we wear, etc. etc. So with time we will have a tree full of leaves with blessing notes. Look, I am now more appreciative of things that happen now. Before, there is no such thing. I took things for granted – all the days of the year, any things that happened were taken for granted. I am telling people now, I would rather live a short, meaningful and purposely life than a long life which is sickly and full of worries. I appreciate a simple life. Never mind if I have less money provided that I am comfortable and have my three simple meals each day. So to me, even if I have to “go” tomorrow, I am happy. C: Do you fear death? Is there anytime in life that you think: Ah, tomorrow, I am going to die and you are afraid of it? P: No, I am not afraid to die. In fact, my friends and I used to joke about death. We often talk about dying. I even told my friends to play my favorite music in my wake. C: Before you had cancer, would you dare to talk or joke like this? P: No. I would be scared to do such thing. Why should I die? I was earning so much money and I have a long way to go yet. I used to dream that I would have a high position, run a big organization, bla, bla, bla. Now, all this materialistic things do count much anymore. C: Now, you are happy? P: Yes, I am very contented with what is happening now. There is no such thing as I need to do things to leave a legacy for people to remember me by when I pass on. I am contented that I have lived my life and I am happy that I don’t intentionally hurt other people. As I have told you earlier, even if I have to “go” tomorrow, I am happy to accept it because what I am supposed to do in life, I have done it. What I do not do, I don’t regret for not doing it. C: OK, one last question. If the cancer is a person and is sitting right out here in front of you, what would you say to this cancer? P: I would say: Thank you for coming into my life. C: Would you really say that? I have told you. It was a blessing. It is because of cancer that I am living this new way of life now. C: Is this what you really what to say that you don’t regret or hate having the cancer? P: Yes. I am saying this not because I am in front of your camera and you are videotaping me. No. Cancer has changed me. Without this cancer, I would not possibly have been what I am today. Even if I don’t survive these 12 years, take it from me, cancer has changed my life. It has given me a new meaning about life and I am happy and satisfied with it. I am glad that I am able to share my 12-year experience as a cancer survivor with you. There is nothing great to boast about, but one thing that I have found is an awareness to appreciate life and what is happening now. From the descriptive responses, it appears that patients had come to terms with their cancer and had probably reflected on the meaning of their disease. After that, they tried coping with their problems the best they could. In that process they benefited in some ways. It was suggested that one of the first and important task facing a person who suffered a loss is trying to establish a rationale of such loss 11. Likewise, some cancer patients may need to “find meaning” to be able to resolve their problem before they can concentrate their efforts towards recovery. People find meaning by considering positive implications or benefits of the event that confronted them [ 12 ]. Sometimes people try to make sense of what had happened by attributing it to God’s will, by attributing to unhealthy lifestyle or behaviors or bad luck. By discovering their inner strength to face adversity or gaining insight into the meaning of life, individuals help mitigate their feelings or helplessness and hopelessness [ 13 ]. By knowing why, perhaps patients felt more in control. When people can exert or believe that they can exert control, they adjust to that event more successfully [ 14 ]. A study showed that whereas making sense of the loss is important in the early phases of adjustment to a loss, perceiving benefit may be a more long-term process that unfolds over time [ 13. Studies have linked post-traumatic growth to trait optimism and trait hope [ 3 ], thus implying that not all patients would find benefits in their cancer. It much depends on the individuals and the circumstances they are in. Despite the fact that research has shown that 30 to 90% of people experienced post-traumatic growth and increased quality of life [ 15 there are, however, some researchers who suggested that post-traumatic growth may just be an illusion that reflects coping processes, meaning-making or defensive denial [ 16 ]. The authors argued that “one common response to threats is to perceive oneself as having benefited from the experience by becoming a better person”. Subscribing to exaggeration is one way of alleviating distress. One other possibility is that illusion could be a result of distortion of the past or recall bias. They suggested that “people’s current motivations and desires may affect their recollections of the past”. As a provider of complementary therapy to cancer patients, we recognize that merely being optimistic and having positive feelings do not in themselves cure cancer or prolong life, but positive feelings would go a long way in helping patients cope with their cancer. Patients who showed optimism or who felt good about themselves seek out their healing in a more positive way than those who felt hopeless or lacked optimism. Our study with cancer patients from Malaysia, Indonesia and Singapore showed that like their counterparts in the West, most patients derived benefits as a result of their cancer. These patients appreciated their lives better in addition to have grown spiritually. Their personal growth had made them better individuals and they became more aware of the need to cultivate better relationship with others. The first part of this study involved giving “grades” to a set of questions by participants, such as 2 = “to a small degree”, 3 = “to a moderate degree” and 4 = “to a great degree”. After all were done, we collated and tabulated the answers accordingly. We found this paper-and-pencil method of collecting data rather impersonal. There was no rapport between patients and researcher. There was nothing more a researcher could learn except the grades given. We need to go beyond numbers to be able to understand the sick. In addition, we even wondered whether the grading system was too subjective since different participants would have different perceptions about what “small degree”, “moderate degree” or “a great degree” might mean. Cancer therapists may wish to be able to learn more or clarify further about their patients’ experiences. An in-depth interview with participants or an open-ended question where participants are able to give narrative answers provided more insights as to what are important and trivial from the perspective of each individual. We suggest that more work using ethnographic enquiry be encouraged or carried out. Such work would be more meaningful and helpful.